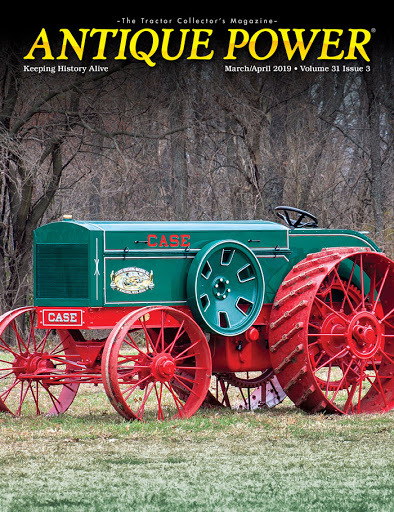 The March/April 2019 issue of Antique Power magazine will be available in subscriber mailboxes and on newsstands soon. Our latest cover tractor is a 1916 Case 12-25 owned by Keith Kuhlengel. It was photographed by Doug Mitchel, and Robert Gabrick researched and wrote the article. Starting in 1913, one of these good Case tractors was the Model 12-25. Built to pull four plows, the Model 12-25 had a 2-cylinder engine with opposed cylinders that produced 12 drawbar horsepower and 25 belt horsepower. It was the last Case model to have a 2-cylinder engine. All Case tractors were tested by means of an electric dynamometer to determine horsepower, because every Case tractor was required to exceed its advertised horsepower. The 12-25’s engine featured a single-piece, cast crankcase with bolted-on cylinders. All cams were case-hardened and ground to proper profile on a specially designed and constructed machine. The crankshaft, camshaft, the gears operating the camshaft, and the connecting rods were all drop-forged. The 12-25 used an external oil pump, which supplied oil to the cylinders, engine bearings, and camshaft. The cooling system had a heavy truck-type radiator and fan and was mounted low on the tractor, which allowed for orchard use. The 12-25 also had a single clutch for both belt and transmission work. One lever operated both the clutch and a brake that could be applied directly to the outside of the belt pulley. A high-grade, nickel- steel roller chain, with a 28,000-pound tensile strength, linked the engine to the first transmission shaft. (The most severe strain actually expected on the chain would be 1,000 pounds, a fact that was cited as Case’s commitment to a good factor of safety.) The 12-25 was the first Case tractor to have an enclosed transmission. To read more about the 1916 Case 12-25, pick up a copy of the March/April 2019 issue of Antique Power magazine! Rick Mannen covers the colorful and vast history of mechanized farming in the Great White North for Antique Power magazine through his "Canada Connection" department in every issue.